Pinterest can be an excellent source of traffic for your small business website. Many small businesses have this preconceived notion that Pinterest is for mothers pinning recipes. Over my time using the platform, I know that Pinterest is for EVERYONE! 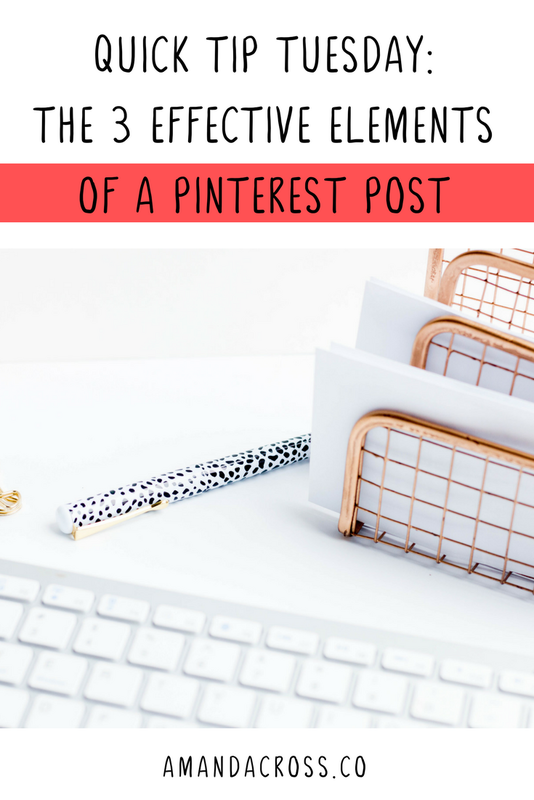 Today I am going to share three effective elements of a Pinterest post so you can efficiently use the platform when you do post. First and foremost, your Pinterest post needs to meet specific dimensions. You are trying to attract people to your pin, and you cannot do that if your image is tiny compared to other photos. Your Pinterest images need to be at least 735 px by 1102 px. You can accomplish this by using the Pinterest graphic template in Canva. Now, you can go much further than 1102 px long. Your Pinterest post can be as long as you want BUT it will eventually get cut off by a read more button, so you need to be careful. Also, you don't want your post to be too long because your readers may get tired of looking at it. I would personally suggest no longer than 735 px by 1500 px. Let's take a look at something I saw in my feed. In the corner, there is a small image boasting "7 Quick Ways To Improve Your Writing Today." There are so many images on the feed that I probably would never have noticed this post if I wasn't looking for small pictures during this sweep of my Pinterest feed. You don't want squares or horizontal rectangle images as your Pinterest images. 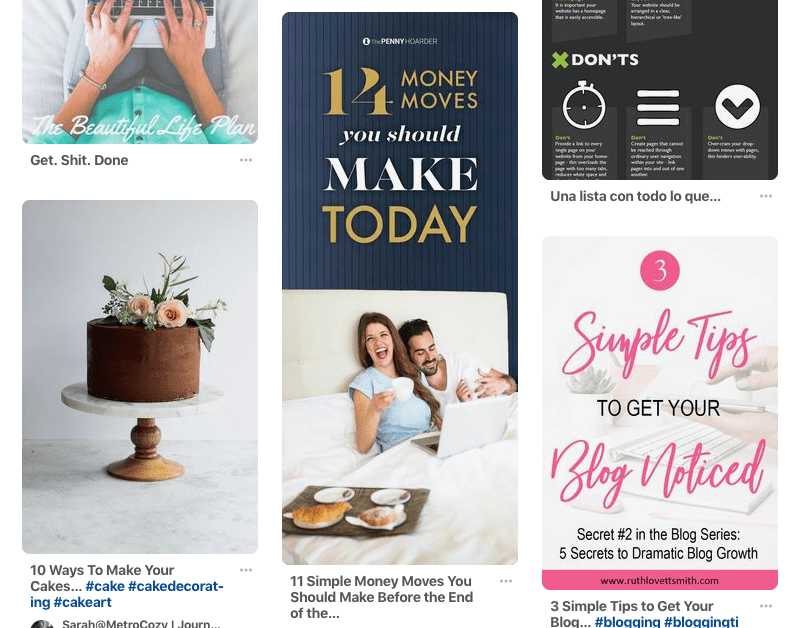 Instead, you want to make sure that you have a vertical rectangle for all of your Pinterest images, even if all you are doing is sharing a quote. People on Pinterest love to pin images with no text, but they like to click pictures with text. 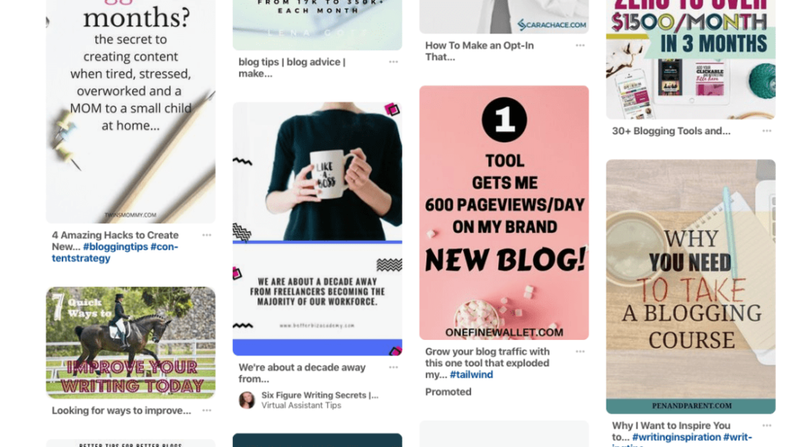 If you want your Pinterest post to bring you real traffic to your site versus just saves of your post, you need to use text on your images. Let's take the image above; it promises "10 Ways To Make Your Cakes..." and honestly, I am not sure, because I didn't even click over to see what the post was about. Compare that to some of the other images on this page. The "3 Simple Tips To Get Your Blog Noticed" also has a title that gets cut off, but I know what the pin is about because they put that information on the pin. Your blogs can still have prominent images (my pins do! ), but you also need to add some text because that will make it easier for potential readers to know what they are getting into. If you like sharing images of your products or whatever your site offers, make sure that you also have another pin style that has text on the images. Pinterest is a search engine. People go to Pinterest to search for things, and they are served content on their Pinterest feeds based on what they have engaged with in the past and who they follow. Your Pinterest post needs keywords in the description so that people can find your post. You can do this simply by adding hashtags to your Pinterest account. In the past, hashtags on Pinterest didn't do much, but Pinterest has changed rapidly since then. Make sure you are adding some hashtagged keywords to each of your posts. For my post Use These 16 Content Ideas To Get High-Quality Traffic To Your Site In 2018 (And Beyond), I added the hashtags #ContentMarketing, #Blogging, and #BloggingIdeas. As you can see, these words are now highlighted blue. These words link to other content related to content marketing, blogging, and blogging ideas. Now, when people search for those hashtags, my post has the chance to show up. When people interact with these topics, Pinterest may serve my post to them because they have shown interest in these topics. A pretty sweet deal, right? With these three tips, you can create an effective Pinterest post every time. When you invest time and energy in Pinterest, you can get a lot of return on investment. I hope that these tips helped you understand Pinterest a little better. Pinterest is the best search engine in my opinion because once you get the hang of it and keep up with it, it can continue to bring a healthy amount of traffic to your site.